Federal officials are working with the state to begin looking at how to wean Hawaii from its dependence on fossil fuels. Here, Mitchel Cohen, left, manager of Sam's Club, and Keith Cronin, SunEdison Hawaii president, inspect solar panel units installed on the roof of the Wal-Mart/Sam's Club complex on Keeaumoku Street. The ideas for powering our future through the state's abundant renewable energy sources are nothing new. Wind turbines supply power on neighbor islands. Solar arrays have become more common as energy-conscious consumers look to save money. And companies such as Pacific Biodiesel have been producing fuel from used cooking oil and other agricultural byproducts since the mid-1990s. To many clean-energy advocates, Hawaii's shift to renewables -- a process that is only seriously happening now -- should be well under way. "I think the hang-up in the past has been cheap oil," says Henk Rogers, an entrepreneur and founder of the Blue Planet Foundation, a clean-energy advocacy group. "As soon as oil is no longer cheap, then people are willing to listen to the alternatives." If the price of oil is any indication, everyone is listening now. From the top down, it is hard to find a government agency, business or average consumer that is not feeling the impact of crude oil costs that approach record highs on a daily basis. Arguably the biggest hit for most is at the gas pump, where yesterday's statewide average of $3.65 a gallon for regular unleaded was just 3 cents below the record high set a few weeks after Hurricane Katrina disrupted the nation's oil supply in September 2005. But where high energy prices have brought financial hardship, advocates also see hope in their efforts to change the global energy culture. Hawaii is positioned to be the test bed for this shift. Already the state has formed a unique partnership with the U.S. Department of Energy to promote and develop renewable energy sources. 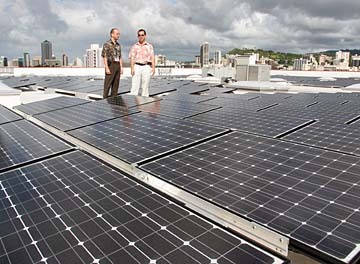 The Hawaii Clean Energy Initiative was announced by Gov. Linda Lingle in her State of the State address this year. Along with the state Department of Business, Economic Development and Tourism, federal officials are working with the state, forming working groups to study four key areas of our energy sector to begin looking at how to wean Hawaii from its dependence on fossil fuels. What works for Hawaii might ultimately be put into practice elsewhere. The goal is to have 70 percent of the state's energy needs come from renewable sources by 2030. Today more than 90 percent of the isles' energy requires imported fossil fuels. Reaching the goal will not be easy. Changing Hawaii's energy system will require fundamental changes in policy, as well as financial commitments from established utilities to upgrade rapidly aging, fossil fuel-driven infrastructure, says Ted Liu, state director of business, economic development and tourism. "There's not going to be one magic bullet, one simple solution set, one path that people can point to and say, 'That's it,'" he said. "The enemy for all of this is: Because we can't come up with a policy that generates immediate return, people lose interest." He compares it with trying to fundamentally change the health care system in America. "The solution to health care in our country is not going to be immediate," he said. "We're going to have to make some serious long-term investments and structural transformation. "Health care costs may go up before they eventually go down, and energy costs may go up before they ultimately go down. It's something policymakers will have to accept and stay the course." The effort will be aided by groups such as Rogers' Blue Planet Foundation. The organization has launched an ambitious conference aimed at bringing together top minds from all sides of the energy picture and from all over the country, to get people thinking about staying the course to finally bring about the shift to cleaner energy. The foundation is convening the first Blue Planet Summit this week, a three-day conference with more than 80 speakers and panelists representing government, power companies, regulators, academia, indigenous cultures, environmentalists, planners and others. "We need to know what real steps we can take to get to the point of energy independence in Hawaii," said Rogers. "I don't want anything to be a foregone conclusion. I want to hear everything." Stephen Reed, Blue Planet Foundation executive director, says the summit also will film TV shows for distribution through DVDs and the Internet to better inform the public of efforts being undertaken. Officials also are working with universities and schools to develop a teaching curriculum dedicated to making progress on clean energy initiatives. To ensure that the talks lead to actual progress, organizers hope to get a level of commitment from participants to implement changes at their organization, Reed said. The plan is to develop a system to monitor progress and to meet yearly to determine what is actually being accomplished. "The idea is that even if it's a small commitment, even if it's only a personal commitment," Reed said, "we want people getting used to the idea that we're making commitments, we share responsibility, we have to do something about this." Organizers say one unique aspect of the Blue Planet Summit is the soliciting of input from indigenous groups -- not just native Hawaii culture, but also American Indians. "There's a tendency to just move forward and neglect the fact that people all over the world live close to the land with nature and their environment," said Ramsay Taum, an expert on native Hawaiian sustainability with the University of Hawaii. "We want to move forward to being green, but what we're doing is we're doing what our ancestors did naturally." Considering traditional cultural practices "asks us to look for a blend of low tech and high tech rather than just relying solely on high tech," Taum said. "Rather than having to reinvent the wheel, it can perhaps get us there sooner because we'll begin to apply principles that are already sound, proven and demonstrated by these cultures."